If you need a brush that cleans your wheels, engine bay and other tough to reach areas the EZ Detail Brush is perfect for you. The extremely soft Nylex memory bristles allow it to safely clean wheels and more. The bristles are soft and flexible but still hold their shape so you can clean quickly and easily. The Full Size EZ Detail Brush is 18" long by 4.5" wide, uses a sturdy handle with a built in rubber knuckle guard and bonded vinyl tip. 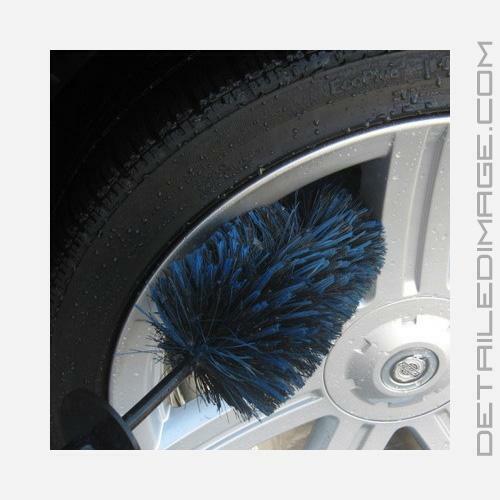 If you have spoke wheels or other tight areas the Mini EZ Detail Brush may work better for you. This brush is approximately 13" long and 2.5" wide and fits perfectly between even the tightest spoke wheels, engine bay compartments, etc. We recommend dipping the brush in warm water and agitating the wheels with your favorite shampoo, wheel cleaner or degreaser. Poke it through the spoke of the wheels and use it around the face of the wheel for a great cleaning. 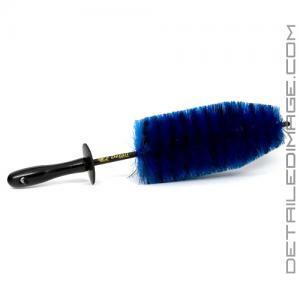 This brush is perfect for cleaning the inner barrels of your wheels that are tough to reach. 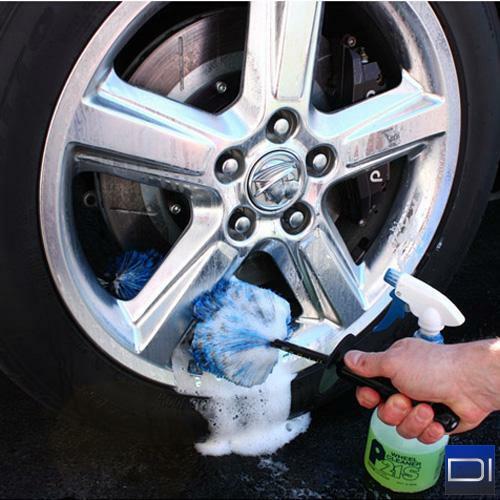 It really specializes in those quick maintenance cleanings so your wheels look totally clean after a very quick cleaning. It's also used to clean the wheel wells on cars that have a very tiny gap between the wheel and wheel well. After just one use you'll be amazed at how much easier it is to clean your wheels and how much time you will save. Save your fingers and back from lots of bending over and scrubbing and start using the EZ Detail Brush. The Mini version of the brush measures 13" long by 2.5" wide in comparison to 18" long by 4.5" on the full sized model. It has soft nylon bristles that are tough enough to cut through grime, yet soft enough that they are safe to use in all areas of the car. The brush also features a nice knuckle guard just above the handle to protect your hands while cleaning tight areas, and a bonded vinyl tip to protect it from scratching. I find myself using the Mini EZ Detail brush on every single detail that I perform, whether it is on the wheels, in the engine compartment, between exhaust tips, in door jambs, and more. It's truly a versatile product that every auto enthusiast should have in their arsenal of detailing tools and supplies! Love this brush! Great for engine bays and door jambs! Been using these Brushes for Years!!!! Perfect size, Great for cleaning Small and Big spaces between wheels. Awesome brush! I love the protective tip and soft bristles. I wish it also had hard bristles to scrub at tar or caked on brake dust areas. Overall, very happy! Wish I wouldv'e bought one sooner.